Jack Wyman of South Freeport lines up a putt on the second hole during the final round at Brunswick Golf Club in this July 13, 2017, file photo. Falmouth’s Jack Wyman admits he didn’t didn’t play as well as he could have during Thursday’s final round of the 99th Maine Amateur Golf Championship at the Belgrade Lakes Golf Club. He knew youngsters Cole Anderson and Drew Powell would be breathing down his neck. But Wyman turned in an even-par 71 and held off the hard-charging Anderson to successfully defended his title by one shot over the 17-year old, who couldn’t overcome a triple-bogey at the seventh hole despite finishing with four birdies over his last seven holes. Wyman, who plays out of the Portland Country Club and lives in South Freeport, finished with a six-under par 207 while Anderson, who will be a senior at Camden Hills High School in the fall, wound up at 208 after a final-round 71. Anderson’s home course is the Samoset Resort in Rockport. John Hayes IV, the 2015 Maine Amateur winner, carded a final-round 70 to post a four-under par 209 and former Bangor High golfer Powell wound up fourth at two-under 211 after a closing-round 73. Hayes plays out of the Sable Oaks Golf Club in South Portland. Powell, who will be a sophomore at Brown University in Providence in the fall, is affiliated with Orono’s Penobscot Valley Country Club. They were the only four golfers who were under par. 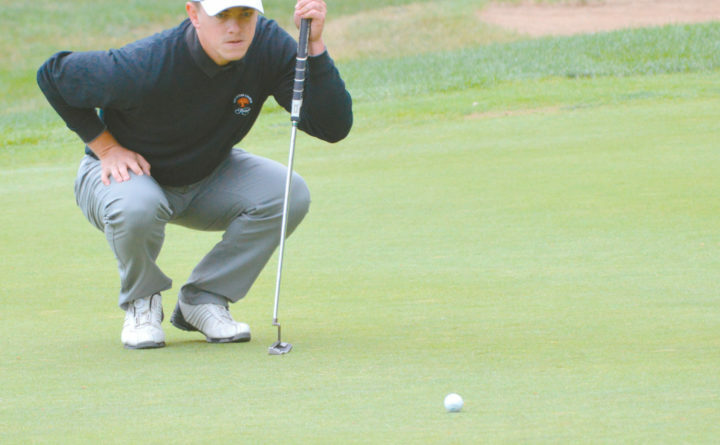 Caleb Manuel of the Brunswick Golf Club tallied an even-par 213 after a final-round 72. From Martindale Country Club, Auburn’s Andrew Slattery, the 2014 champion, and Joe Baker were at 215 and 217, respectively. Rounding out the top 10 were Husson University of Bangor Hall of Famer Joe Alvarez from the Webhannet Golf Club in Kennebunk (219), Craig Chapman of Martindale (220) and three players who tied for 10th at 222: Lincoln’s Lance Bernier, who now plays out of the Boothbay Harbor Country Club; Jason Gall of the Portland Country Club; and Logan Thompson from the Barnes Brook Golf Course in West Enfield. Wyman turned in a steady performance with 16 pars, one bogey and one birdie. Wyman began the day with a one-shot lead over first-day leader Anderson, and he gained a stroke when Anderson bogeyed the par-four fourth hole. Anderson gained that shot back with an eagle at the par-five 510-yard sixth hole as Wyman birdied the hole. But the lead would swell to four strokes when Anderson triple bogeyed the 409-yard par-four seventh hole after overshooting the green with his approach shot and Wyman parred the hole. Anderson’s birdies on 12, 14, 15 and 16 after a bogey on 10 pulled him within two with two holes to play, but Wyman hit a nice tee shot on the par-three, 17th which enabled him to par the hole and retain a two-shot lead entering the 400-yard par four 18th hole. Wyman’s only bogey came on the final hole and Anderson parred it. Hayes was actually tied for the lead after birdies on the first three holes and on the sixth hole. But he bogeyed the seventh and had four consecutive bogeys on the back nine. Powell was two-over par on the front nine with three bogeys, and a birdie and was even on the back nine with two bogeys and two birdies.